More details about AMD's Radeon RX 460 and Radeon RX 470 were revealed at a special launch event in Australia. This model will use the same blower-style cooler as the Radeon RX 480. The Radeon RX 470 has 32CUs, which implies 2048 stream processors, and has a 256-bit memory bus with 4GB GDDR5 memory. Add-in board partners will have the option to make 8GB versions but the reference design is strictly 4GB. There's a 6-pin PCIe power connector on the card but we don't have any details about the TDP. The exact launch date is still a bit of a mystery. According to the latest rumors, it will be by the end of this month, with availability in early August. The Radeon RX 460 is a compact card for eSports. It has 14 CUs, a total of 896 stream processors, a 128-bit memory bus and 2GB GDDR5 memory. Interestingly, the RX 460 looks very different from what AMD showed last month. With a TDP below 75W, the Radeon RX 460 doesn't require a PCIe power connector. 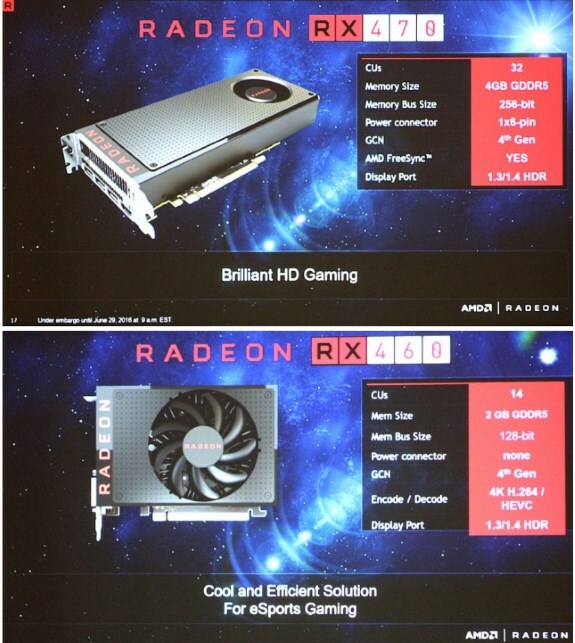 Previous slides from AMD indicated Polaris 11 has 16 CUs so the RX 460 is not a full Polaris 11 GPU. Furthermore, AMD also reiterated the GPU roadmap it showed earlier this year. The only difference is the company now describes Vega as "a high-end architecture for high-end gamers." Vega is planned for 2017 and will be succeeded by Navi in 2018.